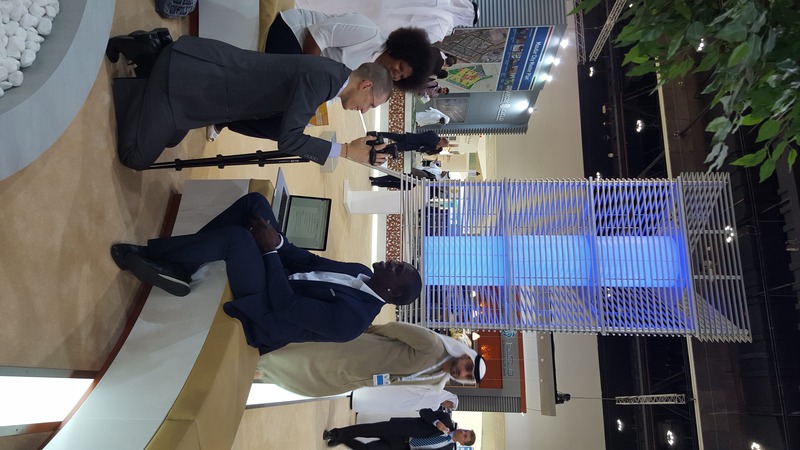 One of the big surprise interviews I got to conduct this year at Abu Dhabi Sustainability Week was an interview with Akon. I wasn’t quite sure if my brain was working right when I saw the name on my interview schedule. 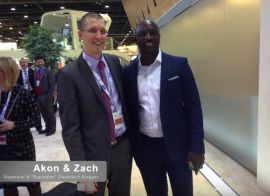 Akon is best known as a popular singer and rapper (except by some of us narrowly focused on the cleantech industry … who know him better for his solar & LED work). Akon was at Abu Dhabi Sustainability Week to promote and improve Akon Lighting Africa, the company he, Thione Niang, and Samba Bathily created to bring solar power and LED lighting to millions of people in Africa. I was honored to spend approximately half an hour with Akon, talking about this initiative, its roots from his end, and related matters. Naturally, with Akon being a famous singer, I wasn’t sure how much he was actually informed, involved, and interested in this topic. I wondered what he was doing beyond offering a famous name and a lot of money. As it turned out, he’s genuinely passionate about this work, and he is personally involved in overcoming challenges to greater growth and broader impact (hence his presence at Abu Dhabi Sustainability Week). I also got into a talk with him about Tesla electric vehicles (he has 4 of them! ), which he clearly loves. Further down, you can see how I inched into that topic and how huge of a Tesla and electric vehicle fan Akon actually is. Below are videos from the interview, followed by some commentary in text about the topics discussed on and off camera (you know, just having a buddy-to-buddy chat, since I’m obviously one of Akon’s best friends now 😉 ). The fact that Akon spent much of his childhood in Dakar is largely what brought him back to Africa to start this initiative. Additionally, though, Senegal is simply a place in great need of electricity (especially clean electricity) and lighting, and he says it is an easier place to have an impact than the heavily regulated United States. Akon indicated in the interview that he has long had an interest in energy due to its fundamental importance for high quality of life. Though, it was hard to pull out of him exactly when the passion about this topic jumped into his body. It seems it wasn’t any kind of “aha!” moment but simply a long interest in helping to lift up society, particularly those who have the least. As you can see in the video, I was curious about Akon’s interest in getting other famous millionaires involved in his initiative, in other such cleantech initiatives, or simply in anything to help the world. For better or worse, Akon isn’t an overreaching evangelist who continually pokes friends to help improve society. Presumably, he doesn’t want to end up being the guy who no one invites to a party (that would be a good way to kill his career and hurt his social life), and he insightfully noted that his friends and colleagues know what he’s doing and he leaves it to them to approach him about the topic. I think the important understanding there is that people who decide to really help the world feel inspired to help from within — external prodding doesn’t do much to help if that internal inspiration isn’t there. Trying to get someone to help when they don’t personally feel inspired to do so isn’t a recipe for fun. One of my last questions was originally intended to be a joke and/or a mental seed to push Akon to go electric (i.e., get a Tesla). However, it turned out that Akon does own a Tesla … er, four of them. He already has the Model X (two of them) despite the fact that only a few hundred have been delivered to customers, and he noted that he was one of the first people to put down a deposit for the Model X years ago. I could clearly see the excitement in his eyes as he talked about his Teslas. As you can see if you watch the video interview, he even noted that he sold all of his Ferraris, Lamborghinis, etc., because they don’t compare to Teslas. He used to have 28 cars but now just has 4 cars — 4 Teslas. That is too freakin’ sweet. I hope it inspires more people to explore Tesla electric vehicles and become Tesla fanboys and fangirls. This was all exciting to hear, and it implied to me that Akon really “gets it” and is an undercover climate hawk. I guess it is not completely under the radar, but he basically teaches climate action using a “lead by example” rather than a “preach to the masses” approach. And isn’t that the best way to do so? The only thing is … I think Akon would inspire a lot more cleantech enthusiasm if he got the word out a bit more about his own love for Teslas and fully electric cars in general.